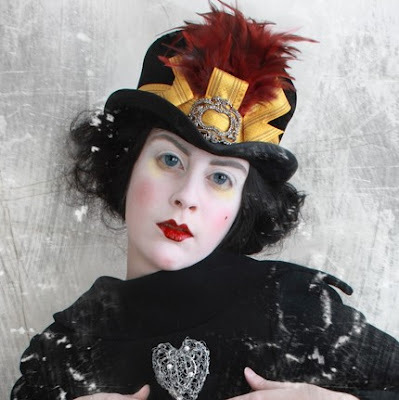 I'm not a wearer of hats, however I love to view elaborate hats of days goneby and also fabulous theatrical creations that are contemporary. 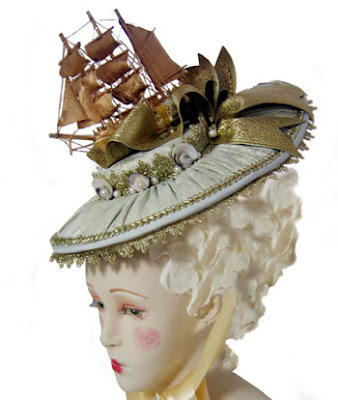 Hats, especially fantasy and whimsy based ones can be wonderful embellishments for one of a kind dolls. 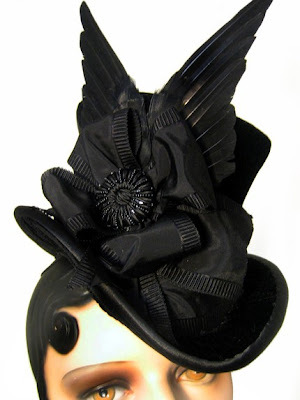 And sometimes a hat can inspire a whole costume for a sculpt. 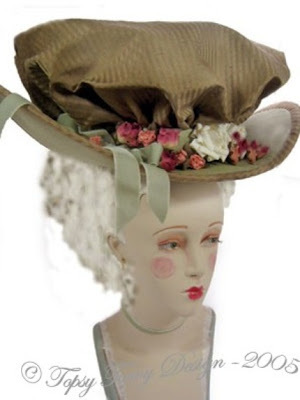 Last night I was searching Etsy for Marie Antoinette type hats (we all know how elaborate they should be) and I came across a delightful artisan, Kim Brown-Dye of Topsy Turvy Design. She is quite a popular seller on Etsy and I'm sure many of you are very familiar with her incredible designs. She is new to me though and I'm thrilled to have "found" her. If you are working on a piece that needs just that extra little touch, or love unique hats, visit Kim's shop (at the moment there are 3 pages of items). And, if you want to "meet" Kim, check out this video that Etsy did on her. Enjoy your Wednesday and see what inspires you! UPDATE: I notified Kim that I had posted a blog about her wonderful hats, and she just left a comment. 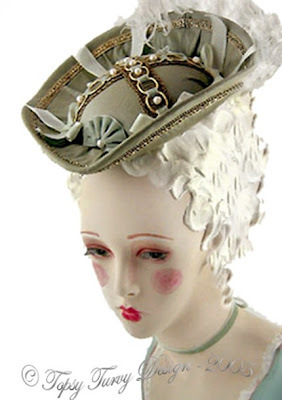 For those of you who don't read the comments, Kim apparently used to make hats for ball jointed dolls...Check them out here - wonderful! Kim, thank you for supplying the link to your bjd hat creations! Wonderful!! Now those are some serious hats Sue. I love being introduced to new and wonderful people. So thank you. 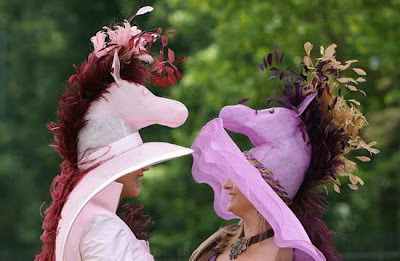 Zan, I heard today that more women watch the Kentucky Derby than men....Think it's the hats? Hmm...Julie, either that or the whole "girls love horses" thing, which probably go back to the childhood riding lessons? Did you guys check out the other weird hats at the Bored.com link? I'm sure some of them were from the Derby. Wow those are some kind of hats! Oh Sue, wait until I show my Sister-in-Law this post here...she is going to freak! LOL These hats are freaking amazing! You always find the coolest stuff out there! Thanks for sharing. These are great! So many gorgeous shapes. Off too view the bjd hats ;]. These are simply exquisite. I am familiar with her work, and periodically check out her site. Her elaborate Victorian pieces just knock my socks off! Thanks for posting - I hope many people discover her! talk about perfect timing! these creations are amazing! (even the silly ones at the very end). Oh awesome!! 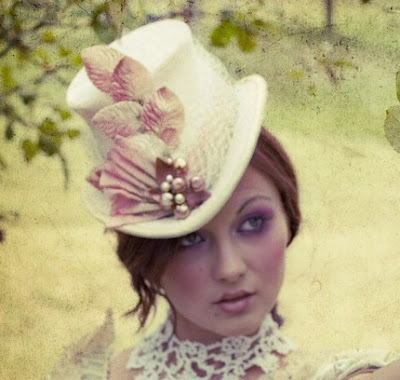 Yes..I've seen her hats, they are to die for! Thanks for sharing!! Her hats are awesome! And so elaborate! I will go over and take a look at her sites.